AGF Mutual Funds Group is a respected financial services company in Canada and a large postal customer. Since their logo is a tiger, the Year of the Tiger stamp was of special interest. 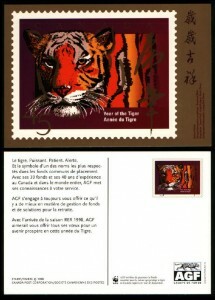 In cooperation with Canada Post, they produced one million special envelopes using the tiger stamp image as postal stationery. This promotional printing was exclusive to their company. This morning we purchased a nice Canada collection and a number a sections have special appeal. One of these if the first postage due set of 11 for CDN $295 as today’s daily feature. The stamps are: J1, light hinge crease $5; J1a hinged $25; J1i NH $35; J2 hinged $10; J2a light hinge $7; J2i hinged $7; J3 NH $95; J4 NH $35; J4a lightly hinged $12, J4i NH $45; J5 NH $85. Sold together as Weekly Feature #55 in our internet store at this link. Today we offer a nice VFNH block of Canada’s few engraved stamps of recent years. The block features 2 constant varieties. The “light in the window” and the “missing spire.” As basic singles this block has a Unitrade catalogue value of $11.60-would catalogue higher as a block. Our daily feature should be attractive. CANADA 715, 715iii, 715v, available from our internet store at this link. 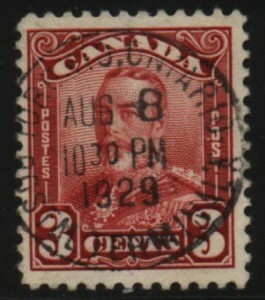 The 1933-34 Postage Due is notorious for poor centering. We offer this fresh well centered block of one cent which has deep colour and is never hinged. Unitrade is $122.50, our daily feature price is less than half that, available in our internet store at $60. You may wonder why we are featuring this Canadian stamp. We have several dozen examples with circular postmarks, many of them better centered than this which has only Fine – Very Fine centering. Many of ours came from an old-time stock of lovely stamps but the source was controlled mail from the mid to late 1930s, so the postmark dates are not legible or used after the normal period of use. It is our experience that most values of the Scroll, Arch, and Medallion issues are tough to find with socked on the nose postmarks during the period of normal use; and one of the toughest is the three cent #151. This example has lovely overall quality. The postmark reads “Toronto, Ontario/Postal Terminal A” around the circumference, and is dated “AUG 8/ 10:30 PM/ 1929. Unitrade catalogue value is $13. Undated examples in our stock range from $4 to $8.